When Will LinkedIn’s Purchase Run End? 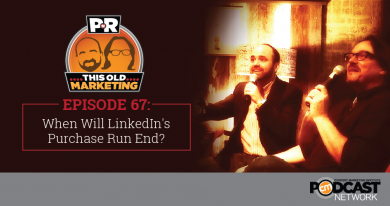 This Week in Content Marketing: When Will LinkedIn’s Purchase Run End? In this week’s episode, Robert and I discuss LinkedIn’s latest marketing solutions launch and what’s likely to be on its radar for 2015 acquisitions to further enhance its toolbox. We explore Seth Godin’s take on content marketing and what the world’s most innovative media companies are doing to stand out today. Finally, we ponder the rise of the Content Economy and The New York Times’ decision to launch a training product. Rants and raves include Time Inc.’s myopic view of its business and how Lego stole the Oscars. We wrap up the show with a #ThisOldMarketing example from Cleveland Clinic’s Health Hub. LinkedIn Launches New Marketing Solutions (4:46): LinkedIn has launched an expanded version of its Marketing Solutions platform to enable advertisers to nurture B2B customers at all points of the sales cycle. The platform now has five main pieces — LinkedIn Lead Accelerator, Sponsored Updates, LinkedIn Onsite Display, LinkedIn Network Display, and Sponsored InMail. These new services are built in part on products LinkedIn acquired from Bizo in 2014. Robert and I identify one missing piece in LinkedIn’s marketing toolkit, and speculate on who it will acquire to fill it. Seth Godin on Content Marketing (14:42): Seth Godin shares his thoughts on the present and future of content marketing in this interview on the Contently blog. One of his most interesting insights, according to Robert, is the idea of moving your content team into a separate building, away from the risk-averse corporate headquarters. I liked Godin’s concept of the ultimate metric brands should use to measure their impact. Unfortunately, it’s not one that would fly in most large companies. Nine Ways The Most Innovative Media Companies Are Succeeding (24:15): Part and Sum, an innovation consultancy, studied the world’s most innovative media companies, looking for data and patterns that point to why they’re so successful. The findings are presented with great clarity and impact. My favorite insights? Partnering is the way to grow an audience today, and a niche approach is much more effective than trying to appeal to everyone. Robert liked the idea of providing an exclusive physical experience for your best customers, such as offline events and print magazines. The Rise of the Content Economy (30:06): This article from VentureBeat explores the sweeping changes taking place in media, advertising, and technology. It digs into the major forces that all stakeholders in the changing ecosystem need to understand and adapt to as they move their businesses into the future. I think it’s a good overview of what’s happening in these fields, but I have a significant issue with the examples they chose to highlight. Continuing with the theme of changes taking place in media, technology, and advertising, check out the post below. The New York Times Creating Products – Education Platform Launched: The New York Times is re-entering the world of education with a new effort called NYT EDUcation, the company announced last week. The Times is collaborating with the CIG Education Group, which helps create branded academic institutions, to develop the program. I predict we’ll see many more joint ventures like this one as publishers seek new revenue streams to replace declining ad revenue. Robert thinks this initiative is doomed to failure, and he explains why. This Old Marketing is sponsored by Marketo, which sells marketing automation software solutions. To help you accomplish your content marketing goals, Marketo is offering a workbook called the Content Marketing Tactical Plan. Download it, fill it in to develop your strategies, and start creating a content machine that truly maps to your goals. It includes staffing guidelines, content planning charts, editorial calendar templates, promotion objectives and tactics, and key content metrics. You can learn more at bit.ly/pnr-marketo. Robert’s Rave: On Sunday night, Lego stole the show at the Oscars with a performance of the song Everything is Awesome from The Lego Movie. During the song, dancers distributed Lego Oscar statues to a number of major celebrities. These stars subsequently took selfies holding their brick awards, which were widely shared on social media. Kudos to Lego for a brilliant example of real-time newsjacking. Cleveland Clinic: This world-renowned hospital launched Health Hub over three years ago to provide patients with high-quality health-related articles and resources. The hospital posts three to five articles per day to the site. The hospital’s marketing team is meticulous about analyzing traffic data to understand what people are searching for and what’s resonating with them, and about responding to readers’ needs. Just how valuable is Health Hub? In 2014, it averaged over 100,000 unique visits per month. Engagement on posts to its Facebook page has been as high as 60%, well above the average for most brands. This is a great example of content marketing done right.